PhilaPlace - "Housing Conditions in Philadelphia"
Title page, preface, maps and housing tables from "Housing conditions in Philadelphia, an Investigation made by Emily W. Dinwiddie, under the direction of a committee of the Octavia Hill Association." 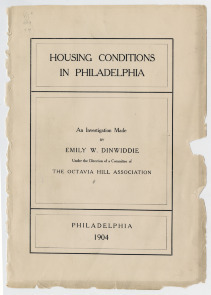 Dinwiddie, Emily Wayland, 1879- , "Housing conditions in Philadelphia / an investigation made by Emily W. Dinwiddie under the direction of a committee of the Octavia Hill Association." Philadelphia, 1904.